One of these companies is Evergreen Aviation who received over $1 billion in 2006. In 2013, prior to mysteriously closing its doors, Evergreen Airlines admitted to signing contracts with the USAF to modify the weather. 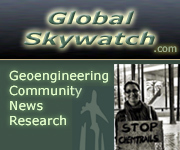 Was Evergreen Airlines a CIA front for geoengineering projects?